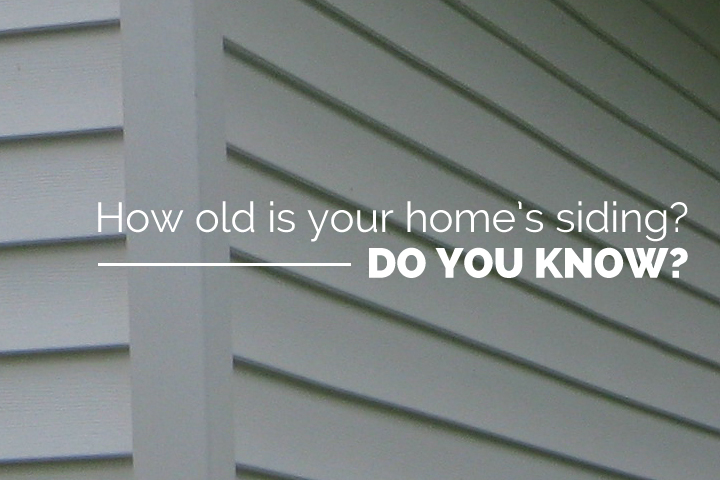 How old is your home’s siding? Do you know? If you’re not sure how long your home has had the same siding, don’t worry – you’re not alone. Many of us don’t keep track of how old our siding is, especially if it was last replaced before we bought the property. Ultimately, more important than knowing the age of your siding is being able to spot the signs that it’s due for a replacement now. Your home, both inside and out, offers a lot of clues that will let you know when it’s time to install new siding, so watch out for these five common indicators. If these problems are cropping up in your home, give us a call at Siding & Windows Group and our contractors can help you choose the best replacement option. Even the untrained eye knows that when your home is missing sections of siding or your siding is starting to fall off, it’s time to call the contractor. In fact, if you can stand at a distance and see significant, damaged areas, you’ve already waited too long, and there may be structural problems that go deeper than just your siding. Does your home’s exterior need to be repainted on a regular basis due to fading, chipping, or peeling? While this may seem like regular home upkeep, your siding should be able to retain its color for 8 to 10 years. If you’re noticing a lot of external wear and thinking you should grab some paint and a brush, check to see if there’s any warping or cracking in the siding. Often, chipping and fading are the first signs that you need new siding altogether. In fact, peeling paint or even sagging wallpaper inside your home is also a sign that your siding is worn out. This may seem strange since there are several layers between your siding and your external wall, such as insulation and dry wall, but when your siding is worn out, moisture from outside your home can get inside and permeate through your walls. If you can’t identify any internal reasons why your paint or wallpaper is falling off the walls, it may be time to look outside the home. Another sign that your home may be due for new siding is the development of mold or mildew beneath the panels or inside your house. Mold and mildew grow when there’s water damage, and over an extended period, moisture can rot through parts of your home’s frame and even cause severe health problems. If you discover mold, you’ll need to consult a professional to make sure it’s fully eradicated. They’ll be able to do this safely and let you know whether the mold in your home is dangerous or just a nuisance. Is your air conditioning bill much higher this summer than in the past? You might initially attribute this to the increasing cost of electricity or assume that temperatures this year are simply higher. However, the real reason you’re paying so much to keep your home comfortable may have more to do with your siding than the weather. Aging siding doesn’t insulate your home as effectively, causing your air conditioning and heating units to work harder to maintain the same temperature. If you’ve concluded that it’s time to replace your siding, you may just assume that you’ll be putting up the vinyl or maybe aluminum siding that your house has now – maybe in a different color, but essentially the same. But before you choose a material, talk to your contractor about what kind of siding might be best for your home, both from a financial perspective, and in terms of quality and longevity. For example, vinyl has remained popular because it’s easy to care for and requires very little maintenance, and if you opt for insulated vinyl siding – a newer option – your home may also be able to achieve Energy Star status. Vinyl typically isn’t very attractive however. In order to cover your home, you’ll need to create seams where the panels overlap, which many dislike. And while it insulates well, vinyl doesn’t decompose well, and will sit for years in a landfill when it eventually wears out. Wood siding is a classic choice for home siding, but it requires more maintenance than any other option. It has a higher likelihood of rotting, and you need to be vigilant to make sure it isn’t developing mold, mildew, or suffering insect damage. It needs to be re-stained every few years and is one of the priciest options on the market. One material that many homeowners haven’t considered for their property is fiber cement siding, which is made from recycled materials, and is also very long lasting. It doesn’t rot and you’re typically guaranteed at least a 30-year lifespan on fiber cement. Additionally, fiber cement is termite resistant, fireproof, and can be molded to resemble different materials, allowing you to customize your home’s exterior to suit your style. At Siding & Windows Group, we highly recommend James Hardie fiber cement siding because of its durability and visual appeal, but also because it’s a product that more than pays for itself. By installing fiber cement siding, you can actually increase the value of your home by more than 100 percent, making James Hardie siding a better investment than any other siding variety. Whether you’re planning to remain in this home until your retirement, or you’re upgrading old siding before selling your home, James Hardie siding outpaces the competition when it comes to value. Fiber cement costs nearly the same amount per square foot as vinyl, yet offers much greater protection, higher quality, and even greater visual appeal than any of the competitors. If you’re interested in replacing your aging home siding, contact Siding & Windows Group today to request a quote. With over 30 years of experience, Siding & Windows Group stands out from the pack, and now it’s your turn. 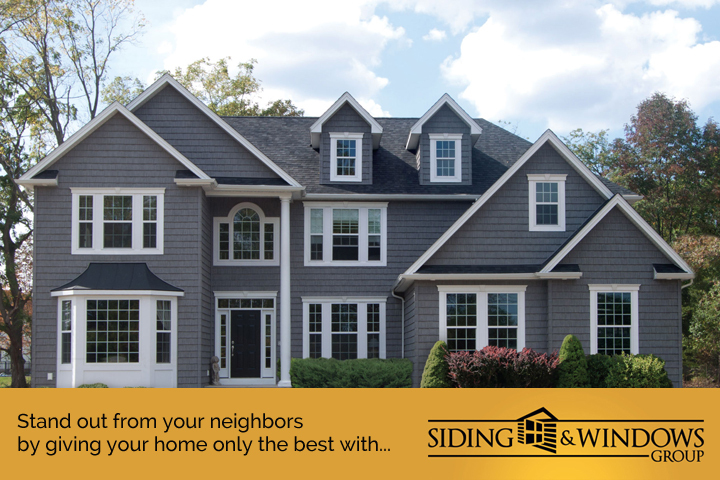 Stand out from your neighbors by giving your home only the best with Siding & Windows Group. Please note we are a Chicagoland company, and only service Illinois and the surrounding Chicago suburbs and communities. Siding & Windows Group is rated 4.9 out of 5 based on 437 reviews from around the Web.